Another Doce & Gabbana cutting edge style Animal print aaccessory that will keep you out of the crowd. White Leopard print with brown gradient and Sport Wraparound. 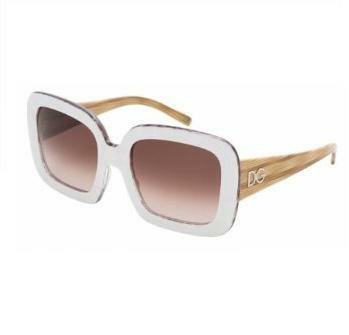 Dolce & Gabbana sunglasses are world known and top of fashion, with their high standards of quality!!! The two founders, Domenico Dolce and Stefano Gabbana, have always been the creative source of the brand. Dolce & Gabbana is Irony: a fashion label inspired by the street, contemporary music and everything that is now, for a personal style free from the constraints of pre-conceived notions and formats. Dolce & Gabbana D&G brand was created in 1985 and has grown to become one of the top luxury goods Groups in the world.